I believe that when we are ready and open, a spirit animal will appear to us – as our teacher, friend and guardian. This spirit animal may be a life companion who remains close to us, throughout our entire life. Alternatively, different animals may appear to us as we change, embrace new experiences and grow. The Lion represents courage to be our authentic self – to speak and act in harmony with our heart…even if it means, we stand alone in a crowd. The Lion does not expect others to lead him, nor does he search for followers. He seeks respect, rather than attention. The Lion knows he is here for his own journey of experience, learning and self discovery. He acts in accordance with his own heart / inner truth. He assumes full accountability and self responsibility for his own choices and actions. As a leader, the highest service Lion offers others is to live ones truth and lead by example with integrity and compassion. for being true to ourselves? at the expense of our own feelings and needs? instead of speaking our truth with conviction, compassion and inner strength? “authority” over our choices and lives? “The greatest fear in the world is of the opinions of others. Most of us have experienced years of conditioning, which has separated and brought into question our inner Lion – our own, inner sense of authority – knowing, feeling what is right and true, while also feeling compassion for others. It is time that each of us recognises the moments in our lives where we step back (consciously or unconsciously) and hide the Lion within ourselves. This also includes hiding our creativity – the gifts and talents we were born to develop, be and share with others. As more of us are growing in consciousness and take full responsibility for the choices and actions we are co-creating in our lives – we can support each other to trust and open ourselves for new and different choices. Choices that move us in the direction of our heart and soul…. often into the unknown…. towards the sun…. towards the light of love and truth…. The more of us who make this inner work a priority – the more easy it becomes for others to do the same and to honour and follow their own inner Lion – their own light of love, truth and soul wisdom. As a female, (in this lifetime 🙂 ) I feel that embodying Lion energy is a journey towards maturation and being comfortable with the masculine energy/side of myself. I believe this takes a lot of self reflection, practise, patience, courage, love and ultimately is an on-going process of inner work to heal and transform my shadow. The “Lion and the Sun” painting has brought into the light many of my core fears, which limit me from expanding towards my true Self with confidence, clarity and purpose. My inner critic kept saying; “your Lion has no fire! 🙂 He is not strong enough, fierce enough, wild enough, courageous enough…how can he stand up for himself and others, when he himself looks…. timid…weak?”. And so, for a long time, I never felt happy with the painting. I realised after months of working on the Lion, I may never be happy with the result. This is because I put a false expectation of how he “should look”, as opposed to allowing him to express his unique energy and message freely – with out any restrictions or judgements. (Every animal I paint can be a teacher and show me a hidden aspect of myself and others). I could see that putting conditions and judgements on the painting of the Lion, is similar to how I am often feeling about myself and how I function in the world around me. Strength does not appear in the same ways for all people. It’s how we value ourselves and our uniqueness that makes us strong. we learnt to feel or be comfortable with as children. to what was accepted and expected of us by family members, school and society. Embodying/being Lion energy does not mean we are an angry, wild warrior who lets our pain and hurt overcome the compassionate feelings of our heart and true being – and go out and hurt, judge or condemn others. When we “fight” from a wounded energy – against people, society and a superficial, decaying world based on patriarchal values – we can end up feeling exhausted and burnt out. So often, we can project our shadow (the dis-owned, unconscious parts of ourselves) out onto the world and others. We may keep attracting similar people and experiences, which reinforce the core wounds and negative beliefs we hold onto from the past, about ourselves, others and the world. This can see us unconsciously re-enacting our trauma and re-wounding ourselves again and again. Inner strength grows through valuing and acknowledging the Self i.e. devoting time and space for our own processing and self reflection. We give ourselves permission to feel and connect with the emotions of our shadow, which our relationships, people and events in the world trigger for us. Right now, as women, it is especially important we are taking opportunities to do this inner work of healing and transformation. Through our own inner work, we are healing thousands of years in a wounded patriarchal system and re-writing a new script based on the feminine values of nurturing, love, connectivity and harmony. It all begins within each of us. Each moment, we are influencing and changing the course of our children’s and grandchildren’s future, as well as the future of Mother Earth. Mother Earth is a living, breathing, ancient being. She is reflecting back to us our own pain… and the pain of centuries of women who lived before us. As women, we are carrying the seed of Mother Earth’s ancient wisdom inside of us. This is because we have the gift of creative power to bring forth new life into the world. We are channels for the divine feminine energy of healing, restoration and rebirth on the earth – especially at this time! But we can only do this as much as we are tending to our own inner garden first! Often, the first step is to reach out for support, because the cycle of trauma over centuries has seen us internalise our pain, our anger, shame, guilt and to hide our true feelings from those around us, for fear of judgement and persecution. interferes with our finding the wisdom that lies in the fruitful darkness. 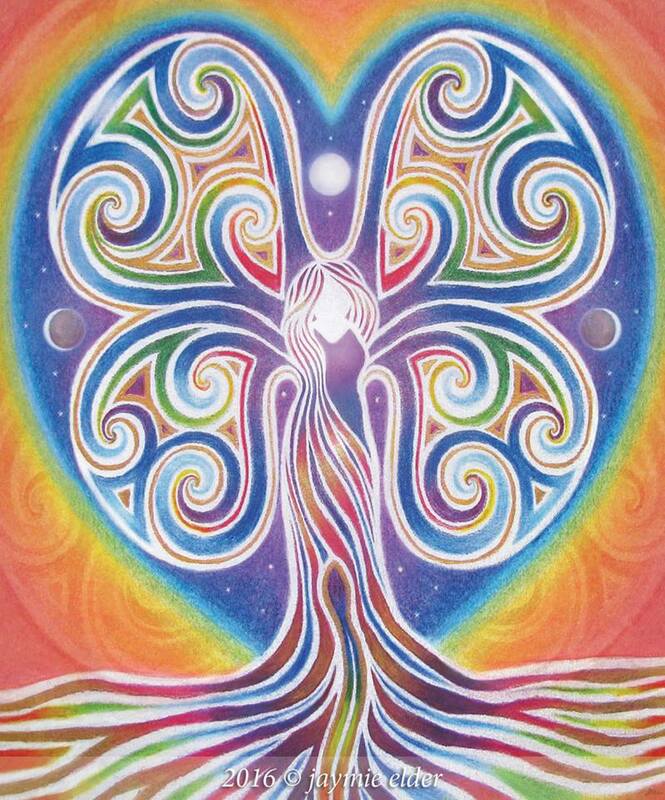 Inner strength is self sustaining and grows deeper like the roots of a tree, over a long period of time. The more we trust, follow our heart and find the courage to honour our truth and soul being, the more we come into alignment and harmony with our inner Lion. The inner strength of our Lion will ultimately lead us to make new choices, embrace the unknown and a creative path, which is uniquely our own and no one else’s. The more we are embodying the Lion energy in us, the more we realise how our conscious choices and actions do affect the whole. We realise our own energy (being true to who we are) can send out a ripple effect to influence others, sometimes in profound, mysterious ways. When I work with people in Soul Sessions, I ask them to spend time with an animal painting, which they are drawn too. Please feel free to do the same, with the Lion that speaks to your heart. I encourage any feedback or comments in all of my posts … you are welcome to share your personal experience with your own inner Lion. Please note: I approach this article from the experience and perspective of being female. I believe we have each had many lifetimes as both male and female. It is equally important for men to explore and understand the feminine as well as the masculine energy within themselves. This is a pivotal time on the earth of transformation and rebirth. I do believe it is so important that men feel a sense of worthiness and value in their role as “protector” of a sacred space, which allows for the sacred feminine energy to heal, nurture and rise again anew. Words filled with amazing wisdom. Thank you. Thank you Sandra Louise, I’m glad they resonated with you! Much love. Previous Journey with my Lion – what it means to embody Lion energy.